Do you like Minecraft? If yes, play MineFlash! 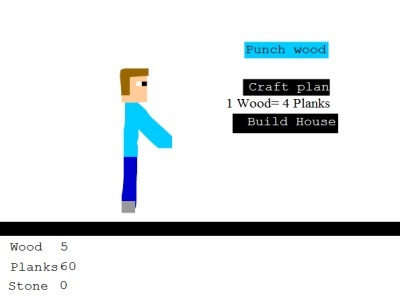 Punching wood, crafting planks, and building houses are three main missions in MineFlash. One wood can make 4 blanks and a house can be made with 40 planks. The number of resources (wood, stone) is shown in the bottom part of the screen field. Let see how much you enable to explore and achieve in this game! This game can be considered as a small game for you to prepare for dealing with bigger Minecraft games. For more information, please leave a message to the creator or read other comments.